Located in Chicago's prestigious Bronzeville Community, just 5 mins from Downtown and the South Loop area, Pearl's Place offers a unique experience, combining delicious home-style foods with the service and attention of a fine-dining restaurant. We offer the best, freshly-prepared breakfast, lunch and dinner buffets in town, featuring southern soul food selections prepared and served by our professional and accredited chefs. 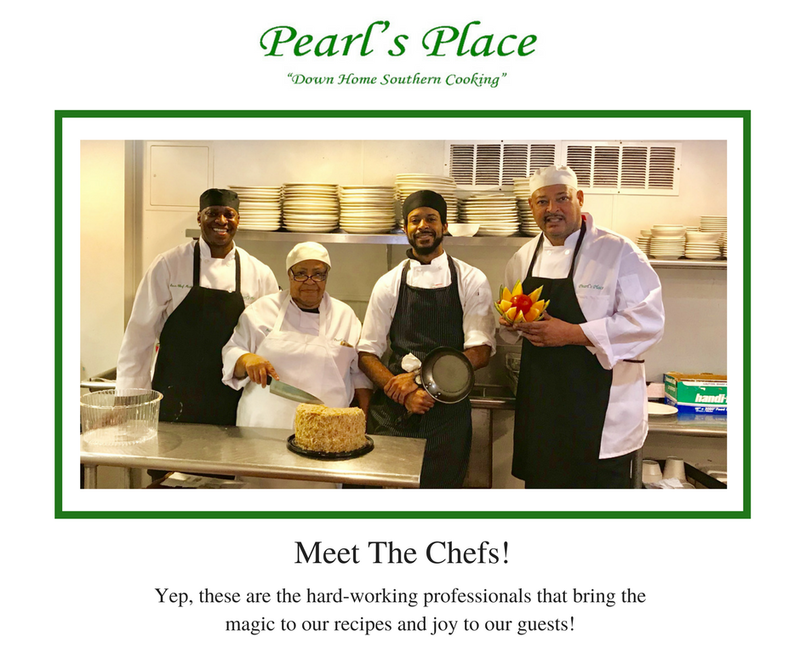 Pearl's Place's owners have deep roots and history in the community, having lived with and served its residents (and all of Chicagoland) for more than 30 years. We're honored to serve so many of the people, businesses, organizations and institutions that we grew up with and learned so many valuable lessons from. Whenever possible, we shop and hire from within the community and have proudly sponsored many local events. To assure all of our guests have an outstanding experience, we hold our suppliers to the highest standards and serve only fine cuts of meat, poultry and fish, fresh vegetables and special seasonings. We believe enjoying a great meal is more than just eating, so we serve the most appealing and appetizing dishes available. We want to inspire each of our guests to look forward to their visit to Pearl's Place as a true culinary and cultural experience. We are a full-service restaurant. Many of the members of service team are from our community, and they're trained to provide high-quality service throughout your visit. Yes, what you've heard is true: At Pearl’s Place Tipping Is Expected/Required. All service workers (waiters, servers, hostesses, drivers and others) depend on your tips as the main source of their livelihood. If you have any concerns, or praises about your server’s performance, please do not hesitate to talk to a manager. Put On Your "Sunday's Best" and We'll Serve You Ours! Dressy or casual, it's up to you. But we do require that all guests wear appropriate attire. Please Cover Your T-Shirt (Absolutely No Plain White T-Shirts, Tank Tops, or other clothing resembling undergarments). No Offensive Language or Images. Please Adjust Your Slacks or Jeans Respectfully. No Beach Wear. No Soiled Work Wear. Serving you is our pleasure. We look forward to seeing you soon. In the early 1930’s, as the famed Harlem Renaissance of Black cultural achievement was winding down, a new surge of African American creativity, activism and scholarship began to flow in the Southside Chicago District, then becoming known as “Bronzeville.” Bronzeville is the most significant landmark of the African American urban history in the United Sates. The area was once the center of Chicago’s African American economic and social life. The cultural upsurge in Bronzeville in the 1930’s and 1940’s took a course distinct from that of its Harlem predecessor. From 1932 through 1950, Chicago’s Black community witnessed, and participated in, starting developments in literature, art, music, social science and journalism. The Chicago Renaissance was also a time of musical innovation in Blues, despite the continued popularity of the traditional “Down Home” styles. By the late 1940’s, Chicago Blues had developed an urban sound without relinquishing its country roots and Chicago became known as the “Blues Capital of America”. Presently, the City of Chicago has committed to working with the community to preserve and redevelop Bronzeville. Fortunately, many of the most significant building in the Black Metropolis have survived. Collectively, these buildings are worthy of recognition and preservation as monuments to the determination of the African American urban pioneers who created them. Today, they represent the center of contiguous activity that defines the Bronzeville community. The Regal Theater at 4710 South Parkway in 1941. Learn more about the history of Bronzeville from the Harsh Research Collection of Afro-American History and Literature at the Chicago Public Library. We believe all of our guests deserve the same dining experience we desire for our own families, with fresh food prepared in the manner we enjoy along with attentive warm and efficient service, demonstrating a true sense of value for their meal. All Pearl's Place employees, from dishwashers and busboys to managers and owners are servants. We serve our guests and each other. We choose to remain united in love, which brings no harm to others or ourselves and always Looks for the best in each other regardless of our imperfections. We exercise patience and humility - instead of our tongues. We recognize that our jobs may include daily challenges, as with any job, but we faithfully expect to overcome them and we choose to enjoy the satisfaction of each days successes as we work and prepare for even greater success tomorrow. We are the staff of Pearl's Place! Mouth-Watering BBQ, Flavorful Jerk Chicken, Outrageous Sandwiches Served on Toasted French Rolls and Fresh Garden Salads. Try our famous Pot Roast Sandwich and our Jerk Chicken Salad!